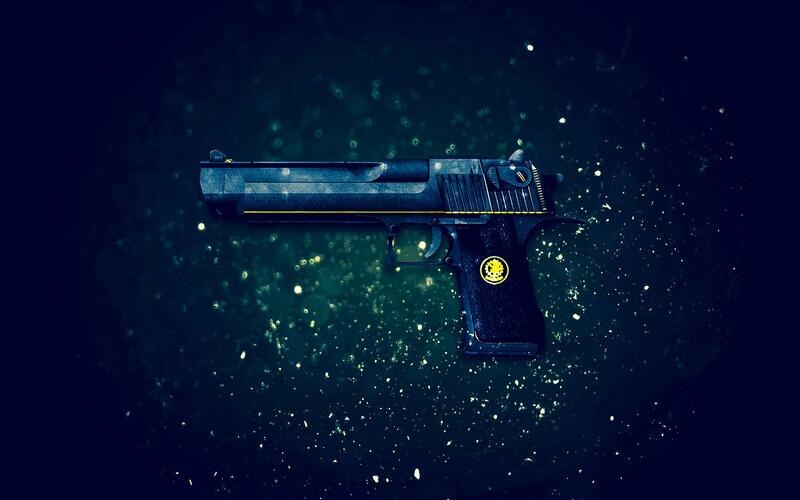 The Desert Eagle is a powerfil semi-automatic pistol which is available to boths teams. In each manazine of it there are 7 rounds of .50 Action Express, and 35 more as reserve ammunition. And now let's take a look at its advantages and disadvantages. Damage is a reason why so many players like this pistol. Even if an enemy has a body armor, you can easily hit him in the head and make a lethal shot, after which it is impossible to survive. Having hit the chest or arms, the rival will have a little more than a half of his health, and thus will become an easy target for rifles and the very nades. However, if you are hit in the legs, even twice, it's most likely that you will survive, though your HP will not be over 10 points. It is important that you remember that while shooting with the Deagle at long range, you should fire one shot at a time, controlling the interval between shots. If you master this weapon, you will become a real danger for any player, since only one tidy shot can take away the life of an opponent in a round. Moreover, the pistol is well combined with the AWP, that would help you at close range. Due to its high penetration you can even wallbang a rival, and thus get an easy kill which can bring you a victory in a round. However, you should not forget about its high recoil — at middle and long distances it is better to fire one shot at a time, while at close range you can feel free to spray. Playing against this pistol, don't forget that any automatic gun at close range can easily beat it. Rifles are the enemy of the Deagle at long range, since they have more opportunities to avoid its attacks. P250, Five-Seven and Tec-9 are the pistols that can compete with the Deagle due to their relatively small recoil and high fire speed. And, of course, it is vital to avoid meetings with the Desert Eagle if you have less than 50 hp, since one shot can finish you off. It is noteworthy, dear readers, that we are not talking about R8 Revolver, since it is not used in pro matches yet, and that means there is no reason to discuss it. Together with it in many bugs have appeared in the game, and I guess I should not mention its imbalance. It's more likely that the pistol will undergo changes, after which we will get back to it.